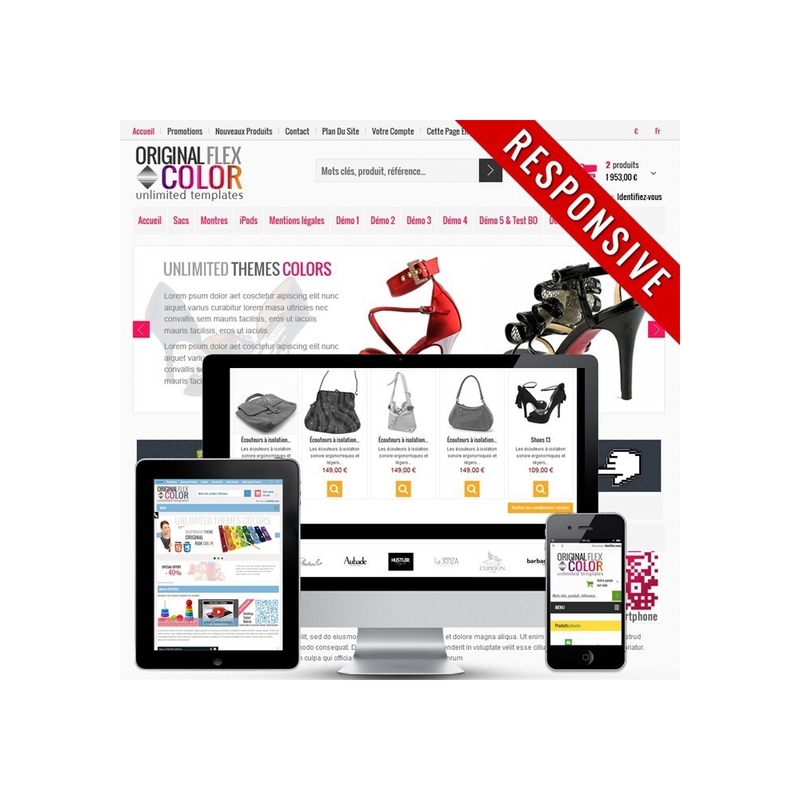 Dress your shop PrestaShop 1.5 and 1.6 with this theme and set from the back office to your shop your colors (links, buttons,...). Easy and automatic installation . Responsives videos on each product sheet. 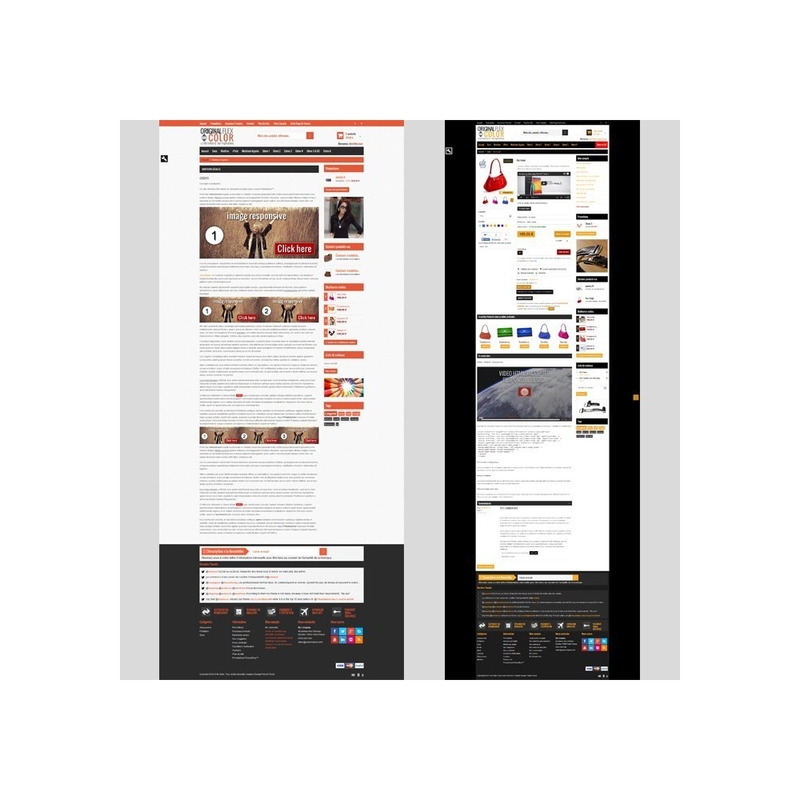 Links iframe/fancybox/thickbox (videos, html, CMS) responsive. List or gread on categories. Option to display by default or not categories product on gread or list. Option to activate or not a zoom on homepage images. Option to activate or not a rotation on categories products images. Option to switch left and right column. Two advertising responsive modules where you can choose an intern or extern link and get round addons/plugins "Adblock". One module allows to display best-selling products (4 products) on homepage and/or on right column. Products are chosen either randomly or by a selection on the whole sold products. 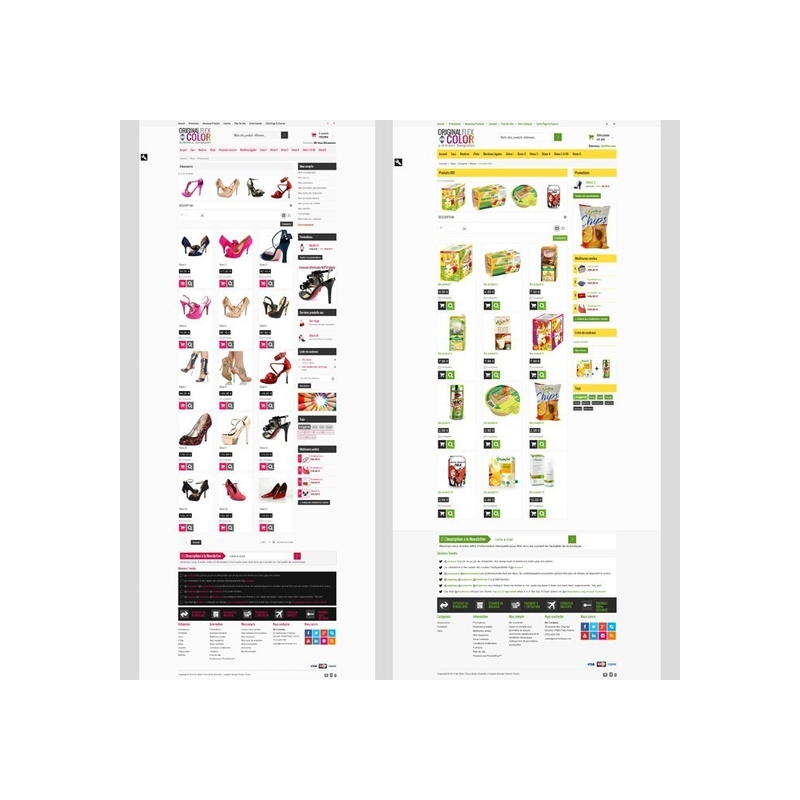 One module allows to display best-selling products (5 products) on homepage and/or on the right column. Products are chosen either randomly or by a selection on the whole sold products. One module allows to display products images on the homepage on black or white version. One module allows to display in a frame, CGV in the order process. One module allows to set up more than 400 settings of the theme (logo, background, colors, butttons, texts...). One module allows to display the products eco-tax on homepage and categories. One module allows to display "Facebook", "Twitter" and "Google" buttons on products pages. One module allows to display Key Products on the home page randomly or not, based on the homepage categories products (4 products per row). One module allows to display Key Products on the home page randomly or not, based on the homepage categories products (5 products per row). 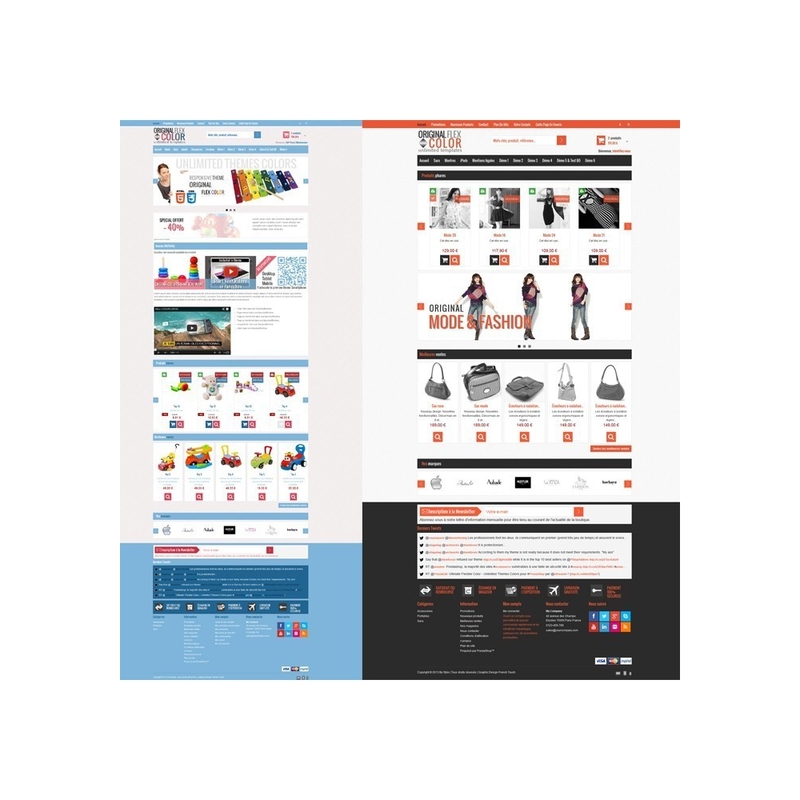 One module allows to display a Carousel Block of Key products on the homepage. One module allows to display a Carousel Block of producers on the homepage. One module allows to display the producer/brand's logo on each product sheet. One module allows to display continuously the horizontal responsive menu (desktop screen mode). One module allows to display permanent links (homepage, sales, news products, contact, Site Directory). One module allows to display a button "Find out more" on products sheets short description. One module allows to display a label "New" on most recent products from Key Products. One module allows to display a label "New" on most recent products sheets. One module allows to display pictograms (In stock, Out of Stock, Web Only) on Key Products. One module allows to display a label "For Sale" and "cut rate prices" on Key Products. 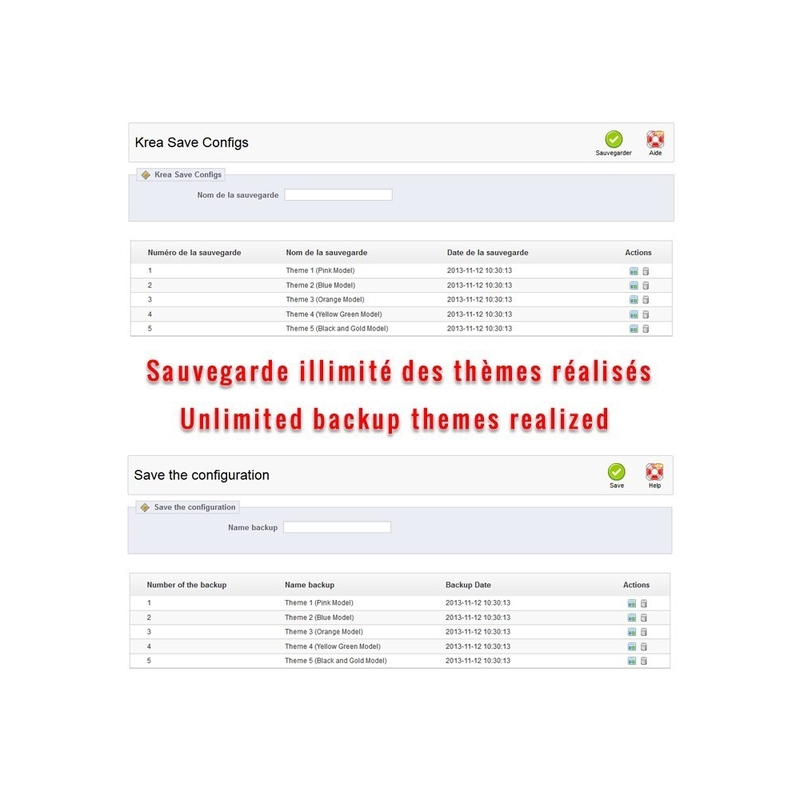 One module allows to save carried out themes modele. One module allows to display Social Networks on the footer. One module allows to display or not Strike-through price and discount prices in % or currency on key products. One module allows to display or not Strike-through price and discount prices on categories pages. One module allows to display a button to slowly go up to the top of the page. One module allows to display Tags on each products sheet. One module allows to display Twitter feeds on the footer and/or on the right column. One module allows to display a button "See the Products of the Pack" on the products sheets when products have a pack. One module allows to display a fanbox to see your Facebook Fan on the footer and/or on the right column. The theme is automatically configured from the moment you use the import module "themeinstallator". This unique theme for all type of store (food, organic, health, beauty, fashion, Shoes, Lingerie) ... thanks to a built-in color module configuration.